The primary threat to vultures is poisoning. People put poison, often in the form of pesticides, on the carcasses of dead animals in an attempt to kill the lions and hyenas that occasionally kill their livestock. Over 100 vultures can be killed at just one carcass, so the impact of this activity has been enormous. Scavengers play a critical role in decomposition and disease control, and the loss of vultures can have huge effects on the environment and can, in some cases, lead to major economic losses as well. Loss of vultures in India is estimated to have caused nearly $34 billion in damages, partially due to an increase in feral dog populations following vulture declines. The loss of vultures in this case led to rabies outbreaks in dogs and humans. In addition to healthcare costs, loss of vultures in Africa could have important implications for the tourism industry given the likely rise in rotting carcasses that would arise from their disappearance. Tourists on safari do not want to see dead animal bodies on the landscape. Vultures are also important indicators of ecosystem health. Given their large range sizes and their dependence on high wildlife density, vultures indicate ecosystem health at the landscape scale. Vultures can also be important indicators of poaching activity as they are attracted to large carcasses, such as those of poached elephants and rhinos. In addition, because vulture populations are likely to be more sensitive to poisoning than are lions, they may prove to be important indicators of conservation success when it comes to mitigating human/predator conflicts. Vulture conservation thus has important ecological and economic ramifications and merits further attention. Vulture experts identified Southern Tanzania as an area likely to be important for vultures. However, little is known about the status, population trends, or threats to vultures in that area. No systematic studies of vultures have been done in Tanzania since the 1970s, and no research has ever been done in Southern Tanzania. 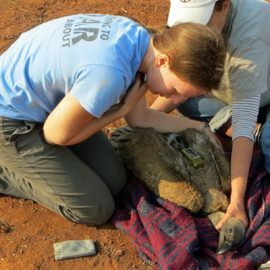 In 2013, the Wildlife Conservation Society (WCS), with support from Corinne Kendall from the North Carolina Zoological Park, conducted vulture surveys using vehicles and roads in Ruaha National Park and Katavi National Park, and confirmed the importance of this landscape for African vultures after finding both high vulture abundance and currently low threats (i.e. limited poisoning suspected). Katavi and Ruaha national parks are the two largest protected areas in southern Tanzania, and sit approximately 300 kilometers apart. Katavi National Park is 4400 square kilometers in area, while Ruaha National Park is 22,500 square kilometers. Katavi National Park is primarily composed of Miombo woodland, though there are several open areas around swamps and seasonal lakes such as Lake Chada. Ruaha National Park is composed of mixed woodland/forest and grassland areas with high wildlife density, particularly of elephants. Both parks are surrounded by several wildlife management areas intended to act as buffers for the parks against human encroachment. In addition, several game reserves (GR) are located north of Ruaha National Park (Rungwa, Kizigo and Muhesi GRs) and provide further habitat for wildlife. The large size of these protected areas and the substantial wildlife populations make them suitable habitat for vultures. In 2014, in order to establish a collaborative and sustainable vulture monitoring program in Ruaha and Katavi, WCS and the North Carolina Zoo, with assistance from the Tanzanian Bird Atlas, developed a training program for TANAPA rangers to teach rangers how to identify vultures to facilitate their data collection on vulture numbers at carcasses and on vulture nests, as well as to establish a protocol in the event of a poisoning event. 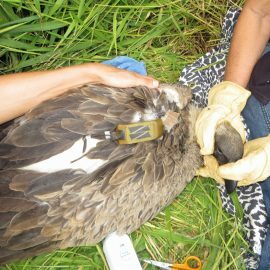 In 2015, we continued survey efforts to monitor populations and also tagged two White-backed vultures with satellite tracking devices. Using satellite telemetry, we can now follow these vultures and see how they use the landscape. Vultures can have huge homeranges, and it is important to understand where they go if we are going to protect them. We also need more information on their ranges to better understand trends we are seeing in the surveys we have been doing. Vulture researcher Corinne Kendall reports on a week spent trapping and satellite tagging vultures in Tanzania.